Popularly know as badaam, the delicately flavored and versatile almond is available throughout the year to make a healthy and tasty addition to both sweet and savory dishes. The almond that we think of as a nut is technically the seed of the fruit of the almond tree, a medium-size tree that bears fragrant pink and white flowers. 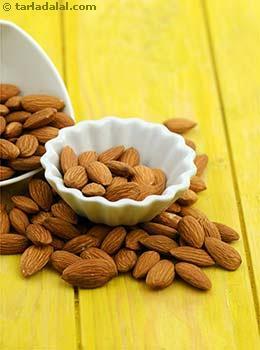 Almonds are king of the nuts which are off white in colour covered by a thin brownish skin. Almonds are extremely rich in antioxidants known to reduce the sign of aging, resulting in shiny and glowing skin. The glycemic index of almonds is estimated to be low. Is almonds safe for diabetics? Is almonds suitable for weight loss? Presence of MUFA and fiber in almonds helps to get better results when you are on weight loss diet plan, as they will help you feel satiated for a longer period of time. Thus controls your appetite. A handful of almonds provides around 100 calories. Even if almonds is a nut high in calories, it doesn’t seem to contribute much in weight gain when eaten in moderate amounts. Several studies confirmed that frequently consuming almonds and other nuts maintain healthier body weights and lowers the risk of obesity. Thus boost ups your overall metabolism.